Home » Banking and Finance » Your First Bike Is Always Special. Secure It For A Lifetime With Bharti AXA General Insurance! Your First Bike Is Always Special. Secure It For A Lifetime With Bharti AXA General Insurance! My younger brother Nikhil recently got himself a new bike - TVS Apache RTR 200 and I was the lucky one with whom he first shared this news. He sounded so thrilled during the call and I was feeling really proud. Time truly flies away so fast, the little boy whom I used to give rides to school on my cycle is now big enough to buy and ride his own bike! Being a bike enthusiast, he had been thinking about buying one for quite some time. Ever since he moved from Delhi to Hyderabad last year, he had been commuting through public transport. He is now well-settled in his career with a well-paying job and so he thought it was time to fulfill his long cherished dream. Your first Bike is always special, more so if it is purchased with your own salary, nothing compares to that feeling of satisfaction and achievement. He enthusiastically explained me all through about his purchase - how he had been planning since the last few months and had been visiting various bike showrooms and how he finally made up his mind on the particular bike model. I was really so happy to hear about his buying experience, but what gladdened me the most was when he told me that he had also got the bike insured through Bharti AXA General Insurance. My little brother has indeed now grown up into a smart, responsible man! Since the bike came at a fairly high price for which he was utilizing his hard-earned savings, so instead of relying solely on luck to protect himself and his bike from any unforeseen mishap, he wanted to secure it by getting it insured. There are quite a few insurance companies around but he was being extra careful not to fall for their promised freebies or other marketing gimmicks but instead chose one of the most reliable insurance companies - Bharti AXA General Insurance. Nikhil made me aware about all the steps and what all the Two-Wheeler insurance plan of Bharti AXA provides. 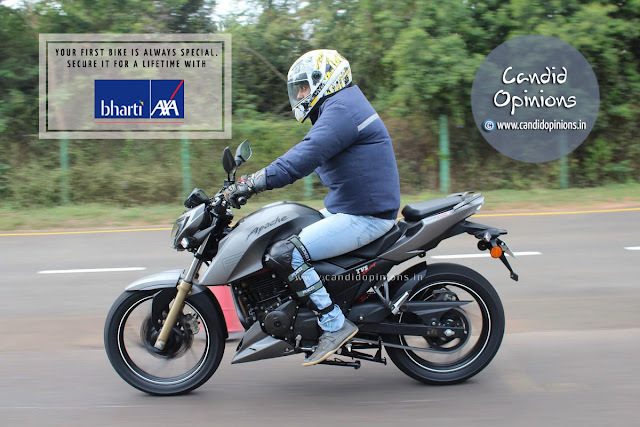 I had heard and read quite a few good things about Bharti AXA General Insurance before and after listening so much about its two wheeler insurance plan from Nikhil, I got even more curious and wanted to check out myself. (4) gives the bike owner, apart from all the above, 24/7 claim assistance and strong customer support. It's a plan that compensates only third-party injuries and their property damages (the one that people opt for only because it is mandatory but it doesn’t protect the rider or his bike and therefore one may skip this plan). The base premium for this bike insurance plan depends on the cubic capacity of the two-wheeler engine and the rates are revised every year by IRDA (Insurance Regulatory & Development Authority of India). This plan not only offers the insured bike owner coverage for any loss or damage caused to the rider and his bike but also protects him against third-party liabilities. Thus it provides an all-round financial protection from losses caused due to accidents, theft and natural disasters. This plan consists of both third-party premium and own-damage (OD) premium (which would vary depending on the make-model of the bike, its year of manufacture, engine capacity and also based on the geographical location. The noteworthy point about both these Bike insurance plans is that they both comprise of the compulsory personal accident cover for the owner-driver, under which just by paying a premium of Rs 50, the insured bike owner would get an amount of Rs. 1 lakh in case of his death, or loss of two limbs or sight of two eyes or one limb and sight of one eye, or for permanent total disablement due to injuries. In case of loss of one limb or siht of one eye, the insured bike owner would receive Rs 50,000. WHY CHOOSE BHARTI AXA FOR THE TWO-WHEELER INSURANCE? (1) With a presence all across India having 79 Branches, one can easily find the nearest branch. Wouldn't one love to have an insurer who is there for him at all times? (2) Moreover with more than 2500 Cashless garages in India, one doesn't have to wait for the reimbursement by Bharti AXA. One can rather get his insured two-wheeler repaired at any of these cashless garages. The repair expenses would be paid directly to the garage while the bike owner only has to pay the excess towards depreciation of replaced vehicle parts. (3) To top it all, the claim process is also almost a cake-walk. With the availability of 24/7 Claim Assistance, one gets round-the-clock assistance from the team to ensure that the rider's claim is settled. (4) One also gets to customize his two-wheeler plan by opting for add-ons as per his needs like Personal Accident Cover for Occupants (which insures against full or partial disability of the co-passenger as well) or the Zero Depreciation cover (with which one doesn't have to pay depreciation on expenses of repaired/replaced parts). (5) The two-wheeler insurance provides a comprehensive cover against losses caused due to Natural Disasters (like floods, earthquakes, cyclones etc), Manmade Disasters (like theft, Fire, terrorism, riot, strikes etc), Accidents on Road, Personal Accident Cover for owner-driver and Third-Party liability (any loss or damage caused to properties or bodily injuries caused to third-party are also covered if the accident occurs due to your bike). Thus one can blindly choose Bharti AXA General Insurance for his two-wheeler insurance. A bike owner can also now opt for the long-term two-wheeler insurance package which would insure his bike for two or three years consecutively. That way, one would get a discount of 10% and 20% for 2-year and 3-year policies respectively on their premiums and thus one would be able to save considerable amount of money. One would also get better NCB discounts. Also one wouldn't have to stress over annual renewals, one just have to renew it once to have a stress-free period of two or three continuous years. Isn't that great? Buying Bharti AXA's two wheeler insurance online is also a breeze. Given the difficult driving conditions that one faces on the Indian roads and the risk of coming across an unruly traffic a distinct possibility, one is prone to become a victim of a mishap anytime. Misfortune often comes unannounced, life is so unpredictable. Therefore one should always be guarded by an insurance policy. Thus wouldn't it be wise to pay a small premium amount to safeguard oneself and the bike from any financial loss? I am so glad that Nikhil has chosen the perfect insurer for his new bike - Bharti AXA General Insurance. If you love your bike and yourself, you too should opt for a 2 wheeler insurance plan. The article was quite useful! Thanks for enlisting the benefits provided by the company, it will help people make an informed decision while buying a two wheeler insurance online.